In my last article ‘Email Marketing Matters’, I discussed the reasons why you should consider an email marketing strategy as part of your larger marketing plan. While the task can seem a little daunting at first, I assure you, it’s really not that hard once you get the basics down! So without further ado, here are some more tips to get you started. 1. What am I trying to accomplish with this campaign? If you don’t have a clear goal in mind, don’t send an email. It’s really as simple as that. When you’re emailing your audience, you’re stating that you have something interesting to share that they’re going to want to read or otherwise act on. If you don’t have a clear goal of what you’re going to accomplish, that will be reflected in the content you produce and the perception. Unlike Facebook or Twitter posts, emailing someone creates the impression of a more direct and potentially intrusive interaction. If you request someone’s attention and then don’t have a clear message to communicate, it is easy for someone to decide that they shouldn’t pay attention to your requests going forward. Do this too often and you’ll lose them entirely. 2. Can this be better communicated in a different medium? Whenever possible, you want to communicate the right information with the right tool! Want to share the great book you read and why it’s impacting your work? Post about it on your blog, or on Facebook/Twitter/etc. Want to reveal a great new feature or product line? Consider sending an email! Outside of a regularly scheduled newsletter, try and reserve your email communication for the most important and exciting announcements or news about your business. 3. Is now the best time to send this email? You’ve finished up your latest email campaign and it looks great! It’s 11pm on a Tuesday night and you want to send it NOW! While you’re free to send it whenever you’d like, it’s in your best interest to target sending your emails during the times in which you believe your readers will actually be around to read it. Most of us have experienced the frustration of having too much in our inbox and deleting everything that doesn’t look absolutely critical. Try and work around this whenever possible so your email isn’t the one that gets deleted! It can take a bit of practice and analysis to determine what’s working best for your readers. If you have the option, try sending the same email to two different groups of your readers at different times and analyze the differences in the resulting open rate and click-through. This will give you a better handle on what works best for your readers and allow you to adjust your send schedule accordingly. In general, I’ve found it’s best to avoid Monday mornings. Many readers don’t open their email until mid-day on a Monday, and are apt to be overwhelmed by the weekend spam pile. Thursday morning has worked quite well for me in the past for whatever reason, but your mileage may vary! Hint: A giant wall of text is not visually interesting. As a species we tend to be very visually motivated creatures. If we see something interesting, we’re more likely to pay more attention to both it and the surrounding content. While it can seem a little unfair in some respects that a nice stock image can draw more attention than the content you spent hours putting together, it can also be used to your advantage! You have a far better chance of people sticking around to read your content if they see something that’s aesthetically pleasing and/or interesting as soon as they open your email. Use 1-3 great, ‘hero’ images, with your best image being the first thing people see. Keep the size reasonable – Remember that some of your readers are likely using an older computer and won’t be able to read your email if your template or images are too large. Now, this doesn’t mean you have to be a great visual designer or photographer to have a great looking email campaign. There are plenty of email marketing services out there with professionally designed templates that you can customize to your business, or have customized for you for a price. While it can be tempting to skimp on the cost of email marketing assets, you need to be aware and weigh how that reflects back upon your business. It can be the difference between scrawling your name and number on a napkin and having a professional business card; both are representing your brand and both have a different impact on how people think of you and the product(s) you offer. This is hands-down one of the hardest rules for me to follow. I have a tendency to be… let’s just say a little on the ‘wordy’ side. It’s easy to fall into the trap of over-explaining every little thing, worried that you’re not providing enough depth or information to the reader. However, your email marketing campaigns are absolutely not the right place for this! You have a very limited window in which to engage and capture your audience’s attention. With the advent of more casual information and communication channels such as Facebook and Twitter, you have an even smaller window of opportunity to capture your readers’ attention! A giant wall of text creates the impression that it will take a long time to read through, often resulting in it being ‘saved for later’ and never revisited, or outright deleted. When you’re crafting an email message, try to keep the following question in mind: Is this absolutely essential information? If the content doesn’t pass that qualification, don’t include it in the email. You can always include a link to additional information if your readers are interested in learning more! Your email campaign should always have at least one clear Call to Action. A call to action is pretty much what it sounds like: Calling on the reader to act on something after reading your email. This can be anything from a link to more information, a way to contact you, or simply links to your various online web presences. If you’re sending your audience an email, you should have a reason for it beyond ‘communicate some information’. Think of it this way: Would you create an advertisement for your business without including a way for the reader to get in touch with you or learn more about your product? Of course not! Don’t do that with your email campaigns either! You can also create a clear Call to Action even if you’re emailing readers about an event that will happen in the future, such as a special sale. In this instance, you could include an image of the product you intend to have on sale, which links out to a special page on your website that goes into more detail, or to a Facebook event that readers can use to RVSP and remind themselves of your upcoming event. Being able to see the results of your email campaigns is an extremely important part of the process. It allows you to see what content is working, what should be scrapped and if you’re starting to experience reader burn-out. It’s a bit like taking a test: Sure you can answer everything, but if you don’t have any way to tell if you got anything right you can’t learn from your mistakes. Delivery: How many people actually received your email? 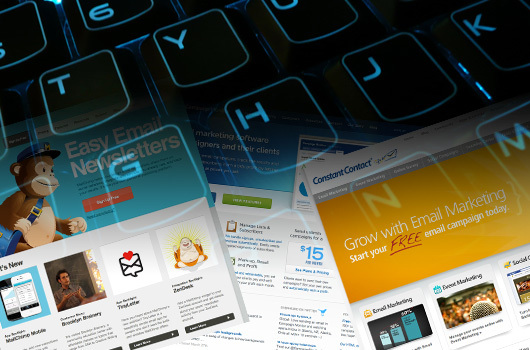 Bounce rate: How many of your emails bounced? If this is a high percentage, you may need to revisit your wording and see if you’re using words that could trigger spam filters to incorrectly classify your message. Open Rate: Of those that received your email, how many actually opened it? Click-through: Of those that opened your email, how many clicked through? If you have a high open rate, but very little click-through, you may need to revisit your Call-to-Action in your next campaign. Unsubscribe Numbers: How many people unsubscribed due to your last email? If this number is higher than typical, what might have caused this? Did your content contain anything potentially offensive? Did you repeat content? By being cognizant of the results of each campaign, you can learn from and adjust your messaging going forward. Learn what works, scrap what doesn’t! Have a website, Facebook fan page, Twitter account or other online presence? Absolutely include a link to each of these in every single email communication you send out. You don’t have to make the links the central focus of every email message, but make them easy to find and verify that the links work for each before sending. While your reader may already know about all of your online presences, having an easy way to get to each greatly increases the chance that they’ll interact further with you and/or your brand. In short, people are lazy: work around their laziness whenever possible!